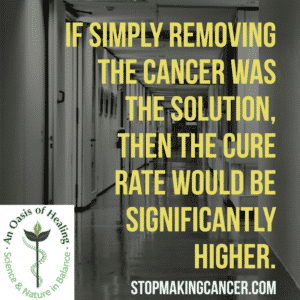 The critical questions you must ask your oncologist as these as the answers you need! Cancer is never localized…it’s never in one spot…even when it is undetectable, there are multiple micro metastases (satellite ‘seeds’). Once a cluster of tumor cells reaches 1 million in number, it begins to travel through the extra-cellular matrix and connective tissue into lymph and blood vessels so that by the time it is detectable, at around 1 billion cells, it has been doing that for at least 1 or 2 years. So, even if the conventional approach with surgery, chemotherapy and radiation is successful and actually gets rid of the primary detectable tumor or tumors, this type of military assault has no effect on cancer stem cells, which can repopulate previous tumor sites and find new fertile ground. If you successfully eliminate all of my detectable tumors, then what? How do I successfully prevent recurrence? Is there any chance that the approach you are suggesting, may increase the likelihood of recurrence? Does surgery ever spread cancer cells? What effect does general anesthesia have on my immune system and liver? How often does radiation cause significant problems and dysfunction? What area of integrative oncology have you studied adequately in order to give me valid options regarding an alternative to the approach you are suggesting? Getting truthful answers to these questions will provide you with a lot of knowledge where you can then make an informed, intelligent decision on the path you choose for treatment.